Oranum Psychics: A Detailed Review. How Accurate Are They? A psychic consultation can be a powerful and moving experience. Psychics provide clarity in times of uncertainty and confusion. Rather than seeking to control and manipulate, true psychics seek to open our options and guide people along the path to healing and resolution of problems. Oranum provides an open source to meet psychics free of charge until visitors are sure they have found the right match for them. There are several things that make Oranum different and superior to any other psychic resource in the world. Two of the greatest difficulties in finding a positive psychic experience are eliminated by Oranum's approach. Finding a psychic is hard enough, but finding a psychic that will be a good match for a person is truly a daunting task. Often a visitor doesn't know how well things will go until after they have paid for and received their first reading. Psychics have a variety of approaches, specialties and tools at their disposal, and no two physics are the same, even if their techniques are similar. Oranum's online approach brings together hundreds of psychics from all over the globe and pools them into a single resource for visitors. The variety of psychics available on Oranum truly helps it stand out from other services. Just about any technique, nationality and language can be serviced by someone on Oranum. A psychic’s specialty, language and photo are clearly visible to visitors, so they can identify someone who fits their needs. The psychics are also given a rating, so visitors can clearly see how pleased their past clients were with their service. Free is a golden word in business, and Oranum offers something in that department that few other psychic services provide. Visitors to Oranum can access the majority of psychics in a free chat environment. This gives an excellent opportunity for visitors to ask initial questions of a psychic that has caught their eye. They can get a thorough idea of that psychic’s specialty and how they conduct readings. Of course, choosing the right psychic isn't all about the technical details and the profile ratings. A free chat gives visitors the opportunity to really feel what it is like to talk with that psychic and get a true understanding of how that person might be able to get in touch with their needs. This service is especially important for a site like Oranum. With so many psychics, it is easy for someone to suspect bad apples in the bunch. Nothing is worse than paying money for a reading only to be unsatisfied at the end. Getting to know a psychic before a paid reading gives visitors the opportunity to be sure they are dealing with someone who has the best chance of giving them a positive experience. All true psychics want to help and offer quality service, but sometimes only the visitor can decide who is best able to do that for them. In addition to psychic services, Oranum also offers free horoscope information to visitors. The horoscope information is well organized and thorough. True to the sight’s multinational focus, the Horoscope information presented is not limited only the common Western Horoscope, but also includes Chinese, Mayan and Aztec astrology as well. This makes it one of the most complete Horoscope information bases on the web. Upon landing, visitors may feel a little bit over whelmed by Oranum. This is mostly due to the site’s large amount of content. There are some minor things that could be improved on their presentation. The overhead navigation bar is small, and most of the links are accessed via drop down, which could make some content more difficult to find than it needs to be. The site also tends to over focus on psychic profiles, but it is after all dedicated primarily to that service. 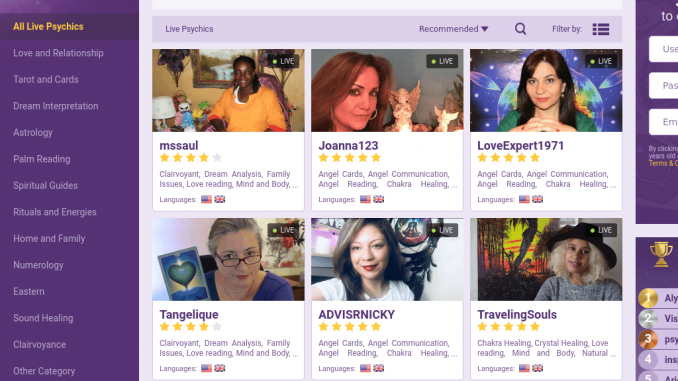 The sample video chat that runs automatically in the upper right corner gives visitors an initial idea of what it might be like to video chat with a psychic. This feature is, however, equally useful and annoying if the visitor navigates through many pages. It can be muted if unwanted, which helps. Overall, Oranum has a minimalist design, with very little additional content or decoration. This makes it not the most appealing site to look at, but does ensure that the focus remains on finding the right psychic to chat with. There is no doubt that offering a video chat greatly expands customer’s access to psychic services. Anyone with a computer, camera, microphone and internet connection can get a psychic reading almost any time of the day without leaving their living room. That level of convenience is hard to beat. The ability to see the person also beats phone chat and similar services. That being said, a psychic reading is often a deeply personal experience, requiring a strong connection between psychic and visitor. Some people can achieve this deep connection through an electronic medium like video chat, but others can’t. Technology itself can be the biggest detriment to video chat. Some internet connections and computers simply aren't cut out for a quality video chat experience. Oranum has no control over this issue and it should not reflect negatively on the site. Unfortunately, unless a visitor has decent hardware and a high-speed internet connection, video chat will probably not work for them. The positive side of this is that since Oranum offers free initial chat, visitors will be able to test their ability to have a positive experience before paying anything. In looking at Oranum as a whole, it is clear that it is a well rounded, complete service if you are seeking a web cam psychic reading. It has many things to offer, whether you are just checking your horoscope or are in need of visual psychic guidance. Oranum’s business model and design ensure visitors will be as satisfied, no questions asked. In terms of convenience, the site cannot be beat. Anytime, anywhere, a psychic will be available on Oranum to help you with whatever you need. The number and variety of psychics available on Oranum cannot be beat. A 3rd generation psychic and natural healer, inspiredbymee, like many gifted mediums, recognized her gifts at a young age. Able to absorb the emotions and thoughts of those around her, inspiredbymee has since dedicated her life to helping others with the help of her own sacred spirit guide. A skilled astrologist and numerologist, inspiredbymee lends her clients a compassionate and thoughtful ear, applying her studies and lifelong experiences to relieve broken hearts, reveal hidden career opportunities, and act as a guiding voice through life's most difficult decisions. If you need that extra, albeit tender, push in the right direction, inspiredbymee is the psychic you've been waiting for. An energy healer and clairvoyant who relies on no tools but his own spirit-assisted intuition, psychicalex2 conducts his consultations with clarity and compassion, resulting in life-changing revelations for all of his clients. Psychicalex2's prayers and insights provide those in need with the knowledge to tackle any life issue, empowering them to go forward with courage and abundance on their side. Are you confused about a loved one, or waiting to take the next step towards your life's goal? Psychicalex2 understands, and is ready to help you on your journey. Life may not always provide the answers we want, but psychicalex2 can provide you with the solutions you need. Jeter28 possesses the divine power to see clearly into all situations, providing real-world answers to your most important questions. With over 10,000 readings to her name, jeter28 combines worldly experience with the gifts of her spiritual foundation, helping others to find the sacred lighted path in their time of darkness. Jeter28 believes that love is the ultimate answer, and surrounds her work with the highest vibrations to protect and secure her client's well-being. Are you bothered by a straying partner, or worried about money? Do you feel like you've come to a crossroads in your life and don't know which move to make? Jeter28 can help, just as she has helped many in similar situations. With over 16 years of experience, PlatonicLfinder specializes in reversing the effects of black magic and negative energies, enabling his clients to move once more with a clear head and liberated heart. Whether it's getting back an ex lover or finding success in career and finance, PlatonicLfinder is at your service. No task is too great or shameful in the eyes of PlatonicLfinder; he believes in practicing without judgement, and only the purest of intentions. Sometimes dark entities attach themselves to us, or we find ourselves at the mercy of another's negativity; PlatonicLfinder can remove those unwanted influences and place the power of personal agency back in your hands. Allow PlatonicLfinder to share his gift of Godly vision with you, and see what wonderful life changes result. Amanlove works with energy connection, rather than tools, to help others in matters of business, love, and life success. An energy healer whose gifts have allowed her to reunite twin flames, find fulfilling jobs and opportunities, and dispel negative energies, amanlove works with a calm and patient heart; she understands that what you're going through is real, and is here to provide the best possible psychic services. Empathetic clairvoyant AlmightyParo uses his powers to get you where you need to be, whether it's a successful career or loving relationship. You don't have to walk in fear or under stress anymore, thanks to AlmightyParo's intuitive guiding voice, which promises never to lead you astray. Life can be confusing, if not downright painful, and AlmightyParo understands that you need a powerful psychic ally on your side. Honest and straightforward in his answers, AlmightyParo knows that you deserve your best life yet, which is waiting just around the corner. Why not let him help you get there today? Able to predict future events and read the energies of others from the age of 10, Seherezada82 nonetheless believes we are in control of our own destinies, and that it is her job to guide us towards our own. Providing detailed answers to any question you may pose, Seherezada82's cosmic assistance can help you find your dream job, soul mate, or see you through a painful ordeal. It isn't always easy to know one's true path in life, but with Seherezada82's powerful guidance, you can make your way back into the light, and in the direction of absolute abundance. Whether it's love or a pressing life question, Seherezada82 is here to provide the assistance you deserve. A psychic reader of nearly a decade, LoveQueen combines her powers of energy healing with deep psychic intuition to provide the best possible guidance for her client. Everyone is unique, and no two people possess the same needs and desires, and LoveQueen regards every client with such respect. With her connective tools she can help you in your own spiritual growth, uncovering new and life-altering opportunities that may have eluded you in the past. LoveQueen believes that keeping a positive outlook is crucial when it comes to manifesting positive outcomes, and surrounds her clients with the love and encouragement necessary to turn sorrow into success. Thetruth04 believes that everything is a matter of energy, and has dedicated his own to helping others manifest everything from new love to a better career. All ages, races, genders, and sexual identities are welcome in thetruth04's psychic circle, and he will treat your concerns with the utmost care and personal attention. Accessing angel energies and with the assistance of the Rider Waite tarot deck, thetruth04 can provide an in-depth analysis for any situation, with answers that are clear and precise. Why live in confusion and fear when you have a right to joy and fulfillment? Contact thetruth04 today to know the truth that is your birthright. Tangelique is a natural intuitive with over 30 years of experience and 20,000 readings under her cosmic belt. A no-tools practitioner, Tangelique delivers the hard but helpful truth, never sugarcoating her answers for the benefit of a softer landing. She believes that lasting change takes a courageous heart, and she is here to guide you with a firm but loving hand. Her straight-up and straightforward style ensures the quickest path towards success, whether it's dealing with a troublesome relationship or finding a new means of income. There's no room for confusion when it comes to finding your true calling, so why hesitate when Tangelique can steer you in the right direction? A queen of spells who uses only divine energy in her work, DaVinciCode's readings are accompanied by a wealth of studies and practices, from multiple tarot decks to astrology, numerology, and white magic, as well as angel & spirit divination. DaVinciCode is an expert on matters of love and personal growth, and can guide you towards the promising new beginnings you desire. DaVinciCode can read your destiny in the cards and crystal ball, and believes in the power of magic to heal all matters of the body, heart, and mind. Intuitive tarot reader TarotAdite can help you find the answers you seek, from the true feelings of a love interest to the possibilities awaiting you in your career of choice. Believing in the power of optimism, TarotAdite takes a positive approach when consulting with a client, and knows there is hope in even the most dire situation. Using her divine tools, TarotAdite will show you the best way to live a happier, more joyful life. Last updated on Sunday April 7, 2019.